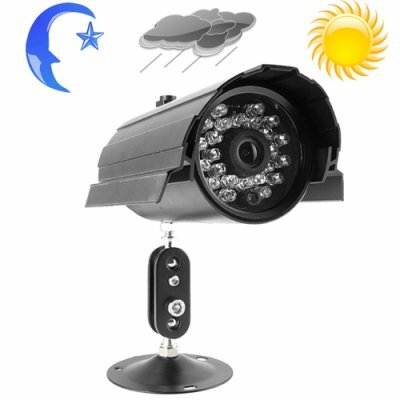 Successfully Added Waterproof IR Security Camera - PAL (SONY 1/3 Lens) to your Shopping Cart. Wholesale priced Waterproof Night Vision Security Camera with Sony 1/3 lens. Great outdoor solution for those who want to get the most value from their home or business surveillance budget. Maybe you're a homeowner who wants to secure the perimeter of your house or a shopkeeper who wants to keep an eye on the back alley or delivery entrance. As long as you're looking for an inexpensive yet reliable outdoor security camera (works indoors too), you're going to love this surveillance device. This color CCD camera is sure to be a bestseller with its quality resolution and long range viewing capabilities made possible with its 1/3 inch CCD lens from Sony. Featuring a heavy duty aluminum case, this surveillance solution provides solid protection against the elements making it waterproof and weatherproof in sleet, snow, or rain. What's more, encased within the head of the unit are 24 light emitting diodes (LED) for perfect night vision even in total darkness. Also included are mounting brackets which along with the mounting holes on the top and bottom of the unit make it easy to the install the camera wherever the need arises. As far as implementation goes, setup couldn't be easier. Extending from the camera are two cables. One is for the power adapter. The other attaches to a male video AV plug which easily plugs into a TV or standalone monitor. That's all there is to it. And because of its great price, the option of buying several units to secure a larger area is now inexpensive and possible. Lastly, every unit shipped is pretested to ensure problem free operation from the leader in factory-direct electronics - Chinavasion. This model is compatible with any modern TV and recording system that can switch between the PAL/NTSC color systems, which includes most security grade DVR's and monitors made in the last 10 years.